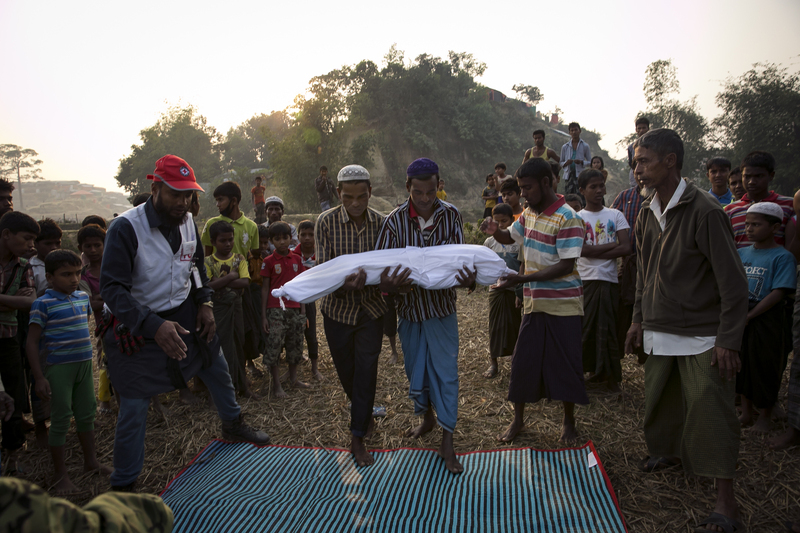 The bodies of Rohingya refugee are carried for burial in Balukhali camp in Cox's Bazar, Bangladesh. 30 year old Nurhaba, 8 year old Amin Sarif, 5 year old Dilsan Bibe and 1.5 year old Arjunan died in the late night of January 11th when their tent in a transit camp caught fire. Their family arrived in Bangladesh 3 days ago from Rasidong, Myanmar. They left their village 18 days ago after the Myanmar military and local Buddhist beat Nurhaba's husband, Adbul Rahim, and refused to let him harvest his fields. For 15 days they walked to the border and took shelter in other villages, with hardly enough food or water to sustain them along the way. When they were finally able to cross over into Bangladesh by boat, Abdul Rahman said they felt happy and confident about their future.